We construct a generalised reward matrix Z(s). 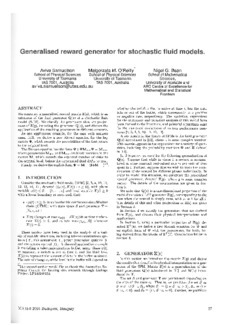 which is an extension of the fluid generator Q(s) of a stochastic fluid model (SFM). We classify the generators that are projections of Z(s), including the generator Q(s), and discuss the application of the resulting generators in different contexts. As one application example, for the case with nonzero mean drift, we derive a new Riccati equation for the key matrix Ψ, which records the probabilities of the first return to the original level. The Riccati equation has the form Ψ + ΨM-+Ψ = M+-, where parameters M+- and M-+ are block matrices in the matrix M, which records the expected number of visits to the original level, before the unbounded fluid drifts to ± ∞. Finally, we derive the explicit form Ψ = M+- (I + M--)-1.